Turkey is taking necessary measures along its 150 km (90 mile) border with the Syrian province of Idlib, where terrorists linked to a former al-Qaida affiliate have taken control, Prime Minister Binali Yıldırım said Friday. 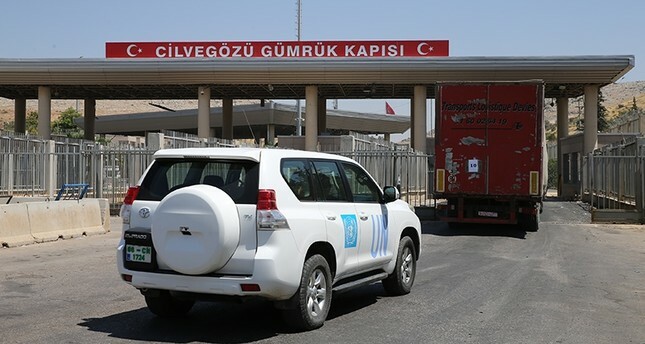 Yıldırım was speaking a day after Customs Minister Bülent Tüfenkci said movement of non-humanitarian goods at the Bab al-Hawa border crossing into Idlib would be limited because the Syrian side is controlled by a "terrorist organization." "Radical groups have recently taken control of [Idlib] and, taking into account the operations to be carried out there, we are taking measures to prevent a human tragedy as well as threats to our country from outside our borders," Yıldırım said. The Prime minister also said that Turkey would not allow the creation of an "artificial state" on its borders, especially in Iraq and Syria. Yıldırım added that the government would not hesitate to defend the country's national interests, right to sovereignty and security regardless of circumstances. Meanwhile, President Tayyip Erdoğan said that the Idlib border crossing would be kept open for humanitarian aid but weapons would not be allowed across. Erdoğan reiterated Yıldırım's remarks and said that Turkey is discussing the situation with relevant countries. "The National Intelligence Agency (MIT) is continues to make necessary discussions with Russia on the topic. In the meantime, negotiations with Iran are being held, and Moscow talks on Idlib went well. I believe we will swiftly resolve the Idlib issue," Erdoğan said. The Cilvegözü border crossing in Turkey's Hatay province is a main crossing into Syria, which shares a lengthy border with Turkey. The border crossing, near the southern city of Hatay, is located across from the Bab al-Hawa crossing north of Aleppo in Syria.